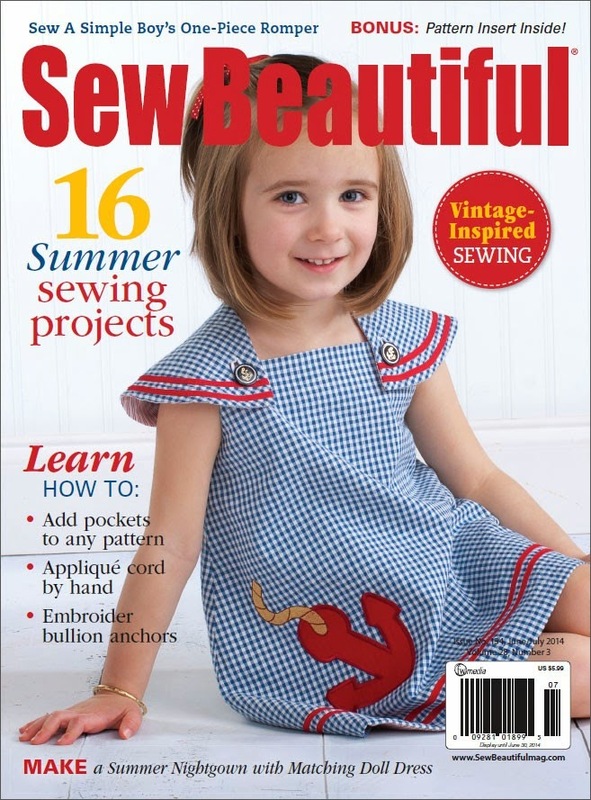 The embroidery design, pattern adaptations as well as additional photos can be found in the June/July issue of Sew Beautiful. I am really proud of the article. I hope you will pick up a copy. 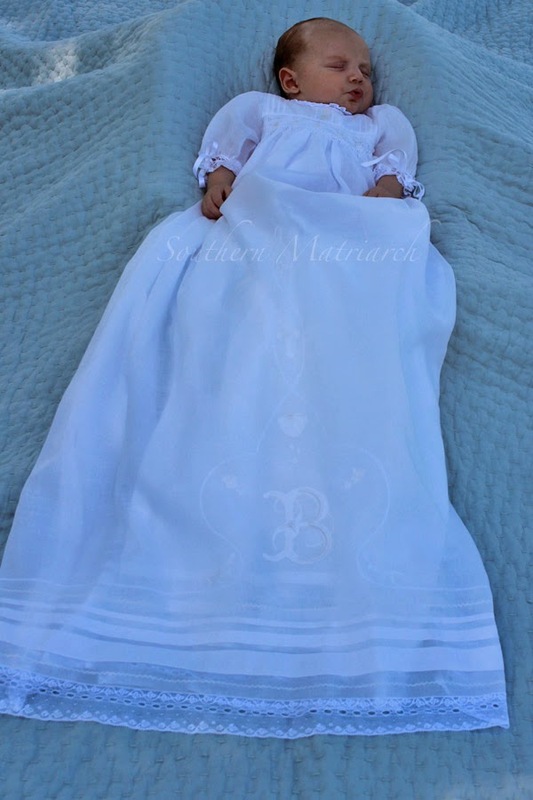 I used an out of print pattern by The Old Fashioned Baby aptly called Old Fashioned Baby Gowns as the base for my gown. It can still be found at many heirloom retailers but you have to be diligent in your search. I found this copy listed at Peanut Butter n Jelly Kids. The yoke was shortened to allow for the smocking and to be a bit more proportional with the overall design for a twelve pound baby. Though I am not quite sure how 39" of gown can be called proportional for a twelve pound baby. My girls like lonnnng gowns. That is okay, so do I. The yoke is interlined with a layer of silk organza. It is difficult for a bit over 3" to support the weight of the 35+" skirt without some extra support. The interlining was added after the tucks and featherstitching. 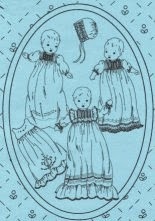 My original intent had been an embroidery motif on the bodice. After three attempts not working I took that as a sign that it wasn't meant to have embroidery there. The antique mother of pearl sequin buttons were the perfect finishing touch. It is VERY difficult to photograph a white gown and I can't find the professional photos I had done. So you will have to endure my taken in the window pictures. This is in the hotel room after I spent a tad over two hours ironing the gown. 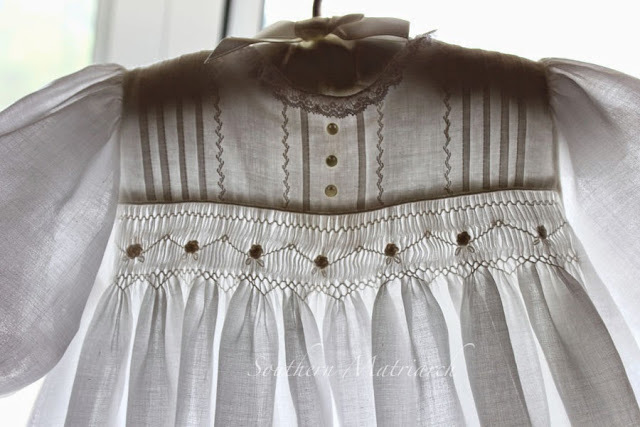 It has three quarter length sleeves edged with beading and lace tied with silk satin ribbons. 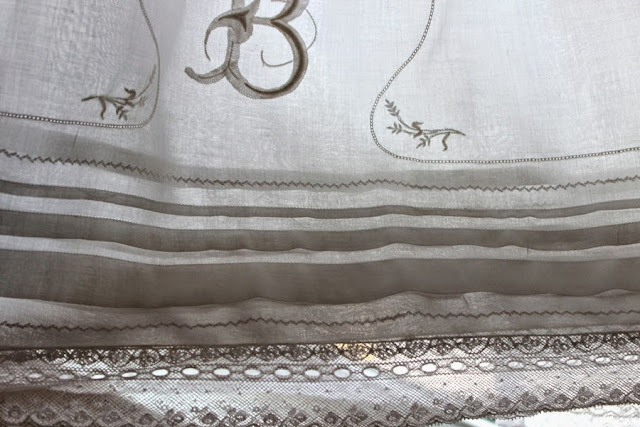 The hem of the gown uses the same lace that was used on the bride's garter posted here. The monogram is adapted from a custom monogram the bride purchased to embellish stationary and accessories. 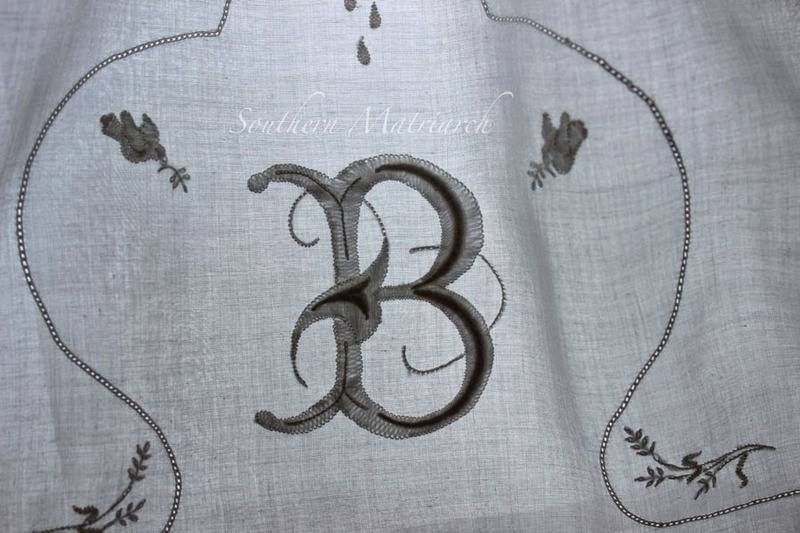 The original monogram is shown here on a table runner and posted here. I love tucks! So there are three additional tucks above the hem as well as tucks down both sleeves. All of the tucks are framed with my favorite antique double feather stitch ala Jeannie Baumeister. That is the only correction to the magazine article. The illustrations for the feather stitch in the article are for traditional feather stitch not the antique double feather stitch that Jeannie teaches. 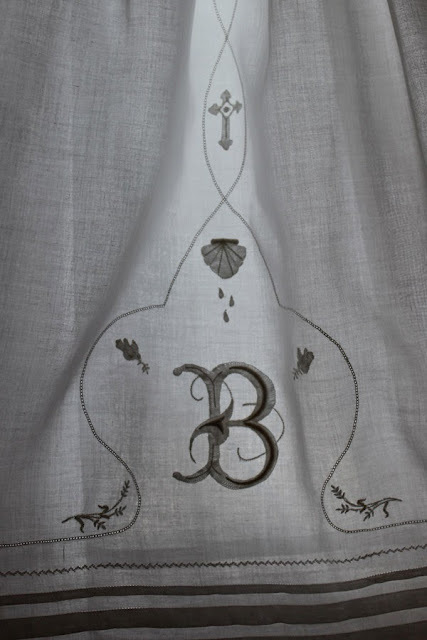 There is also featherstitching featured on the slip bodice as well as tucks and featherstitching on the hem of the slip. I told you, I love tucks and feather stitching. 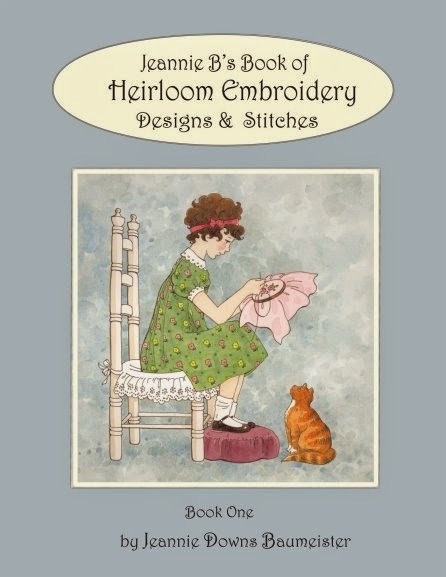 To learn that antique double feather stitch, Jeannie has great illustrations in her book. Her book is available through The Old Fashioned Baby or many heirloom retailers. Or better yet, take a class from Jeannie and watch her stitch this delightful stitch. 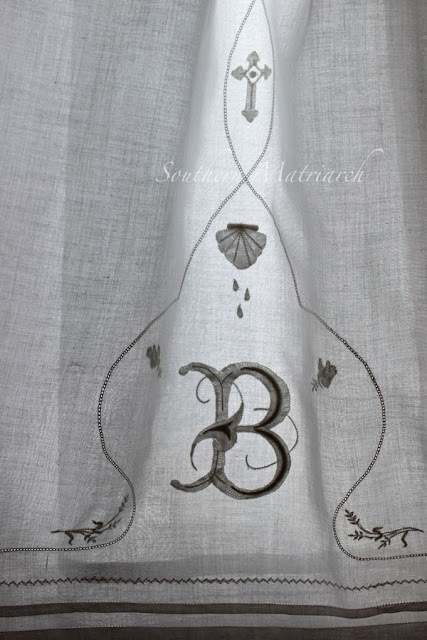 The embroidery design is framed with applique cord. I have a tutorial for this fun and distinctive stitch posted here. You can also find it on the sidebar listed under "Tutorials". 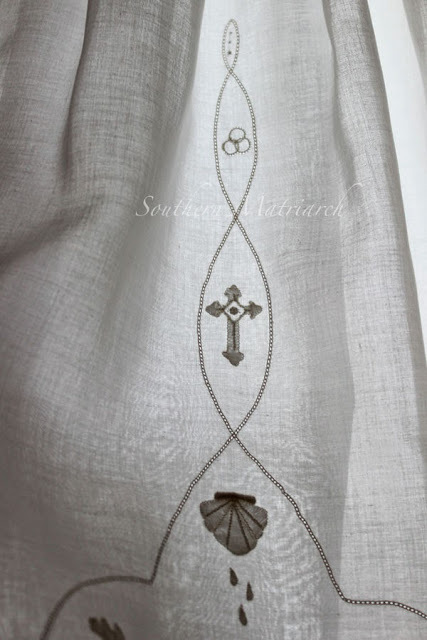 The applique cord is done in a stylized shape of a fleur de lis, it also runs the width of the skirt above the top row of featherstitching. a cross, and trinity symbol of the three intertwined rings. The embroidery is all a mix of shadow work, raised satin stitch, stem stitch and lazy daisies. 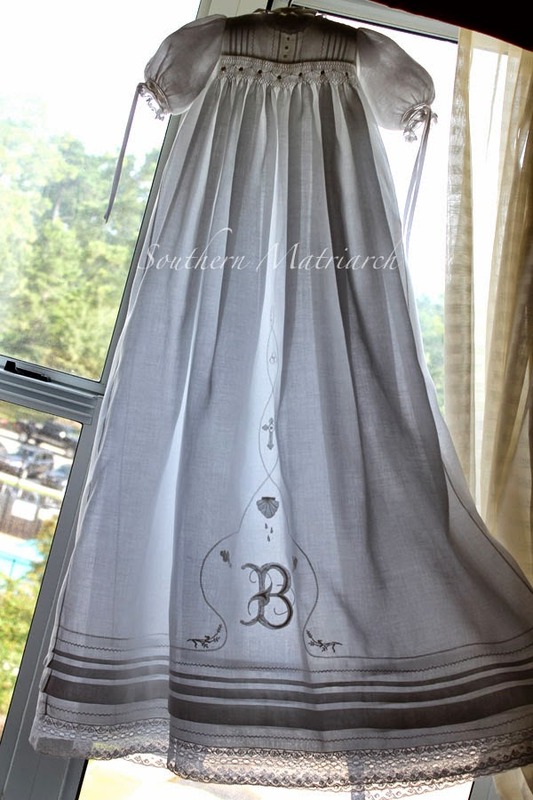 The back of the gown opens down the back and is fastened with two sterling silver beauty pins. This gown like all of the ones I do are a labor of love. A Heavenly Whisper took 250 hours worth of work. And yes I timed it! The entire month of July last summer was spent on my screened in porch stitching at the speed of light. Every minute, hour and day of work is worth it when you see it framing that sweet baby face. Isn't he precious. And yes it is a HE! Many have heard of my edict to future son in laws. 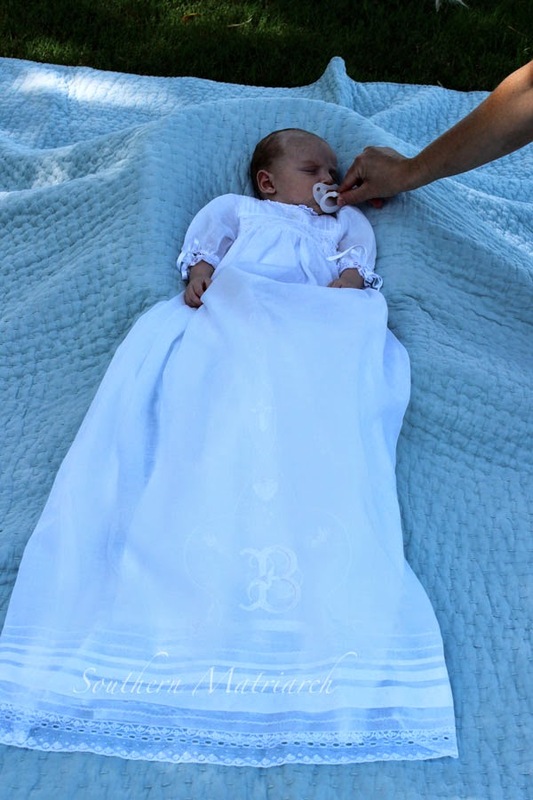 "If your son can't wear a christening GOWN, you need a new girl." And so far they have upheld their end of the bargain. Some random "outtakes" the day of his portraits. oops, forgot the paci. Probably the best photo of the gown I took. "I wonder if his eye works if I stick my finger in it." And I haven't seen that set of car keys since that day. "I am sick and tired of this!" And older cousin saying, "Why is he crying Momma?" That photographer was worth her weight in gold. She was cool and collected, the women in his family were drenched in ladylike "glow". I hope you enjoyed seeing A Heavenly Whisper as much as I did stitching it. This little Peanut's first birthday is next month. Back to the sewing room. Such a beautiful family. Your gown is wonderful. Every stitch is gorgeous. The gown is lovely, and even more breathtaking when viewed in person! Although, I have to say my favorite part may be those precious out takes! Hard to believe he will soon be celebrating one year! amazing! I look forward to buying that magazine. Kids make the funniest models. Thank you so much for sharing. 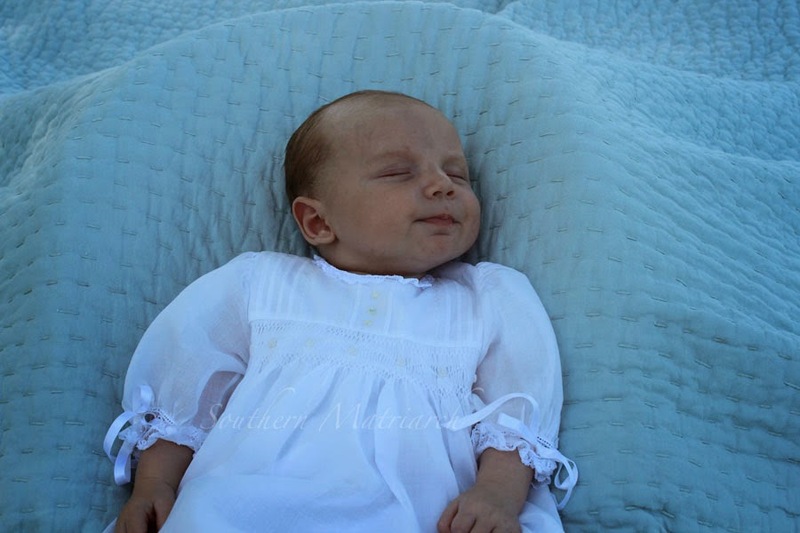 The gown is gorgeous and your grandbabies are beautiful! Everything is beautiful--the babies and the gown. 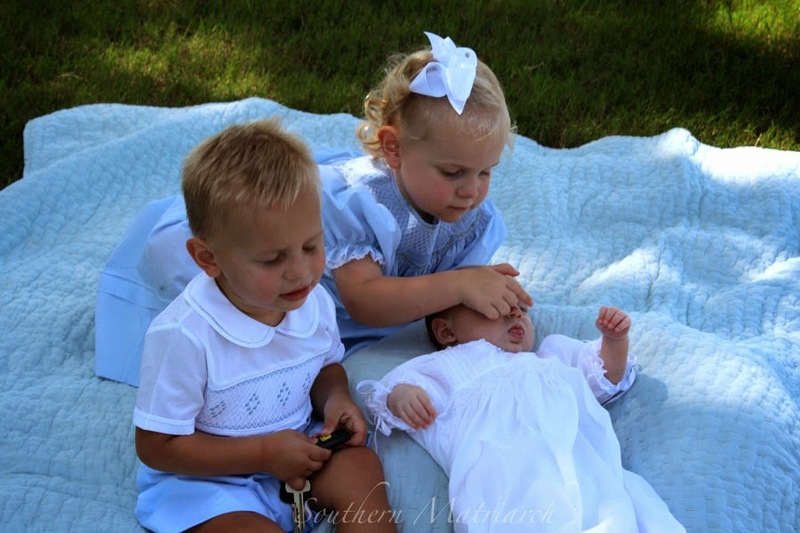 But I think my favorite picture is the finger-in-the-eye photo. That one is so "real." OMGoodness, Martha...this is spectacular! What a true heirloom treasure! How smart you were to think of adding a layer of silk organza for wt. support. I never would have known to do that. 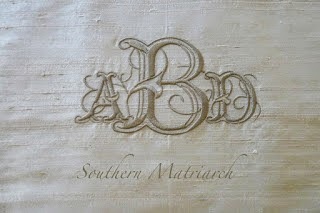 I'm SEW impressed with the special monogram, too. Simply Wonderful!! I adore all the special handwork that you added to the l-o-n-g skirt, which I love even more. 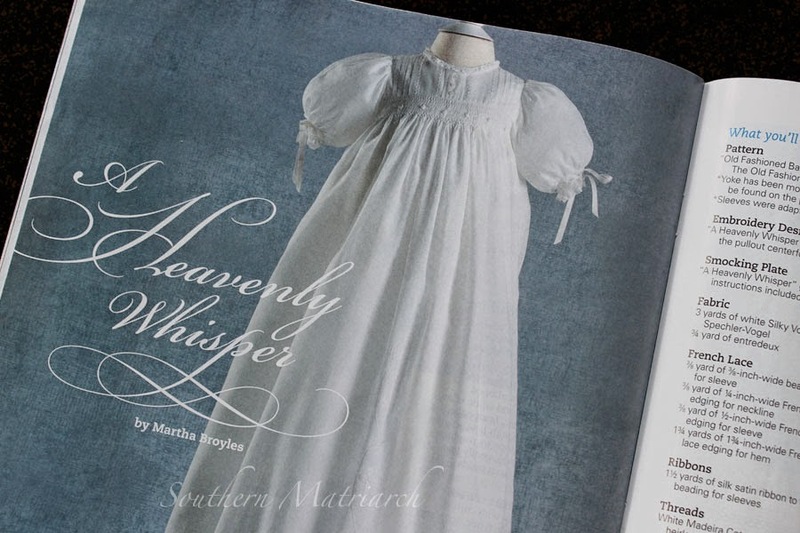 Seeing this creation makes me want to sew something soft & frilly right now. Thank you for sharing this with us & all the love that went into making it. Bless you & your family...they are very lucky, indeed. 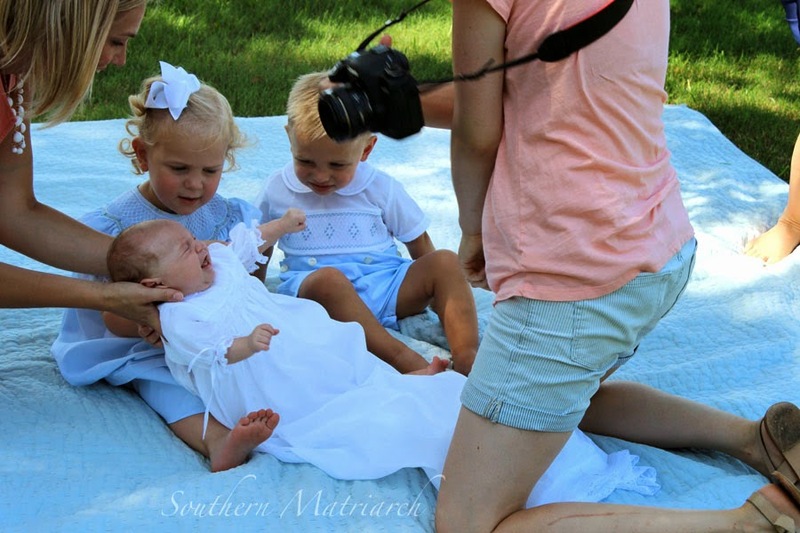 Loved seeing the little ones...that last shot is especially special.